Maybe you've seen those cute tins of fresh ricotta on the shelf and ignored them because you thought that Lasagna was the only worthwhile application? If so, YOU ARE WRONG. Let's discuss. Light and fluffy, fresh ricotta has many uses besides an ingredient hidden in layers of pasta. That's not to say that ricotta isn't perfect in that setting, it's just that there is just so much more it's capable of. The first time I ever put a spoonful of Italian, hand dipped ricotta in my mouth, I suddenly started seeing fresh cheese in a new light. Ricotta was traditionally made as a by product of rennet coagulated cheese making by using the left over protein in the whey to create a completely different cheese. Today though, most ricotta is made from whole or part skim milk. Whey ricottas can still be found (Cherry Valley makes one) but most of the ricotta you see on the shelf is made from whole milk. Just like any cheese, there are levels of quality in the land of ricotta. Cheaper varieties rely on coagulants to hold their shape (like zantham and guar gums) but that's what makes them cheaper. These are great if you are making a huge batch of lasagna and need bulk. Using a higher quality ricotta for baking is recommended though since it is the star attraction. Now that I'm not behind the counter everyday, I find myself getting random cravings. Lately, it's been all about Baked Ricotta. An impending snow storm lead me to acquiring all the things I would need for some warm, bread dipping action. The best part, it's ridiculously easy. Ricotta, preferably hand dipped or basket. I used Calabro Cheese's Hand Dipped Ricotta. Added flavors. This is the fun part. Sweet, savory, wild, spicy, chunky, you name it, it's all possible. Ricotta is so milky and creamy that everything tastes good with it! I used Divina Roasted Red Tomatoes because they are delicious and pretty. Plus, the oil that comes with them is fantastic to drizzle on pretty much anything. These can be found in most olive bars too so you can usually get only what you need instead of buying an entire jar. Of course, I love cheese on cheese so I grated a bit of Grana Padano and freshly ground pepper for taste. You'll need to drain the ricotta a bit before baking (which I didn't do and it lead to hot drainage during baking, FYI). Just wrap the ricotta in some cheese cloth and let it drain for about a half an hour. 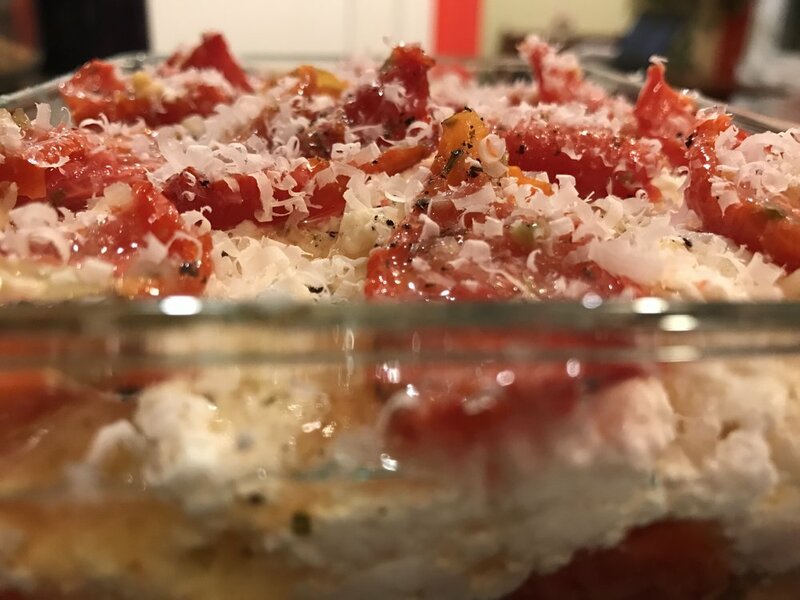 I placed the tomatoes nicely on the bottom of the dish, added the ricotta, and topped with more tomatoes and the excess oil. 20 minutes should really do it depending on your oven. My oven always takes a bit longer so it was more like 30-40 minutes for me. I let the top get a little toasty and since I didn't drain the ricotta beforehand, the water was boiling around the cheese. I then cut up some crusty bread, Macrina Guiseppe, and I dipped my way to a happy and warm tummy. The leftovers are great too for an easy smear on toast in the morning. No heat needed. I have a bit more of the fresh tin left that I'm going to turn in to a pub cheese. Ricotta is a great replacement for cream cheese in those kinds of recipes. It makes dips a little more light and fluffy. Holiday parties are a plenty right now and this is an easy and unexpected way to bring a little warmth to the table.